(BC) 1. SocratesSocrates was influential for creating the 'Socratic diaglogue' Socrates taught his pupils to think for themselves and always challenge conventional wisdoms. Socrates showed the practical benefits of philosophy by remaining calm and detached when faced with his own death. Socrates' philosophy had an underlying spiritual dimension with his philosophy challenging people to know who they really are. 2. Rene Descartes (1596 – 1650) Dubbed the father of modern philosophy, Descartes was influential in a new rationalist movement. The importance of Descartes was that he was willing to challenge previous beliefs - even the existence of God. At the time, this was very radical, and Descartes' books were put on the list of books banned by the Vatican. By allowing people to question previous assumed realities, Descartes opened up a new dimension to philosophy. 4. Thomas Hobbes (1588 – 1679) Political philosopher. His book Leviathan (1651) which expounded the idea of a social contract and had a big bearing on western political thought. Hobbes' importance was the growing influence of democratic ideas in politics. 5. Marcus Aurelius (121 – 180) - Roman Emperor and philosopher. Aurelius gave practical wisdom and a stoic outlook on life. 6. Confucius 551–479 BCE Chinese philosopher and author of The Analects. Confucius was hugely influential in China and Asia. His philosophy laid down a framework and morality for governance and the rule of the state. 7. Aristotle (384 BC – 322 BC) - Aristotle became the leading figure of science and philosophy for many centuries. His scientific works and ethics were the source of much early Western thought. 8. David Hume (1711 – 1776) - Scottish enlightenment philosopher. Hume was an important empiricist and skeptic. Hume had a great influence over philosophers's such as Immanuel Kant. Hume was a free thinker who questioned the religious beliefs of his time and proved hard to pin down. 9. J. S. Mill (1806 – 1873) - J.S. Mill was a utilitarian philosopher, but his greatest contribution to political philosophy came with his work 'On Liberty' By clearly stating the principle of individual liberty in the face of state involvement, Mill stressed one of the most important principles of 20th Century democracy. 10. 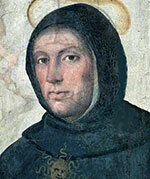 Thomas Acquinas (1225 – 1274) Influential Roman Catholic priest, philosopher and theologian. 11. Karl Marx (1818 - 1883) Karl Marx created the philosophy of Marxims and the strident criticism of capitalist society. Marx created a philosophy which was to challenge Capitalist societies in many ways. Voltaire (1694 – 1778) - French philosopher and critic. Best known for his work Candide (1762) which epitomises his satire and criticisms of social convention. Mary Wollstonecraft (1759-1797) - Feminist, author. Her work, A Vindication of the Rights of Woman (1792) was an early defence of womens' rights. An influential figure in feminism and the campaign to give women the right to vote. Thomas Jefferson (1743- 1826) Third president of the US. Principle author of the Declaration of Independence. Passed law on religious tolerance in his state of Virginia and laid principles of democratic government in America. You missed one, Nicola Tesla. Without his genius, we would still be in the dark. You forgot a very important one, Nicola Tesla.